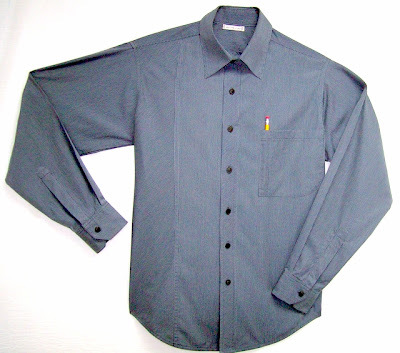 This "Prince Seam" shirt is made from an unusual corded rayon/cotton blend shirting. The fabric has a slight sheen and was a delight to cut and sew. An Original design, the side panel and sleeve plackets were cut on the bias to highlight the characteristics of the fabric. Nice. Check out the points on the collar-perfect! Another winner! Pam, you are so very creative. I know why your customers love you. You really do a great job on the shirts as well as other clothes I've seen that you have made. Hope you are continuing to recover okay from your surgery. Happy Stitching! You are truly a talented and creative person! Sewing, fabric choice, pattern drafting and photography. I always check your site to see what great new creations are there. I am so glad to see that you are back sewing and posting again. Really dig this shirt. All the design details are cool: the bias bits, the angles on the cuffs, the pocket, that prince seam. Cool material too. I want one. Pam, you have so much talent. Thanks for sharing your designs with us. It's so nice to see someone making men's shirts with personality! That is a beautiful shirt. I really like the cuffs & sleeve deatails; all of the design lines work beautifully together. Cool Shirt. Love the fabric and how you used the bias. I agree with the first comment, the collar is perfect!